Moist protein muffins topped with a peanut butter maple drizzle! 1. Pre-heat oven to 350 degrees. In a food processor or Nutribullet, mill 2/3 cup rolled oats until they form a fine powder. 2. 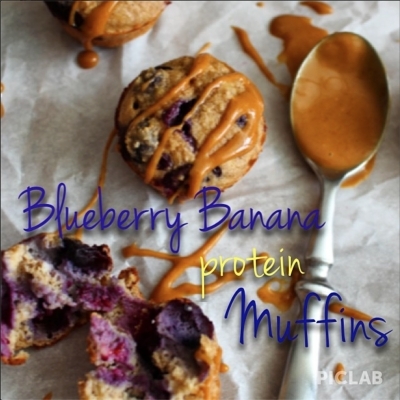 In a medium bowl, mix oats, 1 scoop protein powder, 1/4 cup PB2, 1/2 tsp baking powder, 1/2 tsp cinnamon, 2/3 cup mashed bananas, 2 egg whites and 3 tbsp unsweetened vanilla almond milk until smooth. Fold in blueberries. 3. Spray mini-muffin tins with non-stick cooking spray. Spoon muffin mix into muffin tin and bake for 13-15 minutes at 350 degrees or until a toothpick inserted in the center of a muffin comes out clean. 4. In a small bowl, whisk 2 tbsp PB2, 1/2 tbsp maple syrup, 1/2 tbsp unsweetened vanilla almond milk and 1/2 tsp vanilla extract until smooth. Drizzle onto muffins after they have cooled slightly.